Action from Holbeach United's defeat at the hands of Eynesbury. Photo: Tim Wilson. It’s win or bust for Stamford AFC in their quest to avoid relegation from the Evo Stik Northern Premier Division tonight (April 19). The Daniels have to bring three points back from their game at mid-table Skelmersdale or face up to a Division One campaign next season. Even a win might not be enough depending on results elsewhere. Action from Netherton's win over Pinchbeck in the Peterborough Premier Division last weekend. Photo: David Lowndes. Stamford’s defeat at leaders Darlington 1883 on Sunday (April 17) has left them four points and two places from safety. 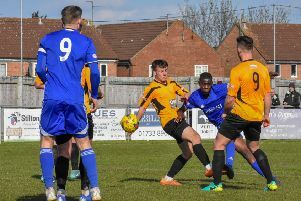 Their final match is very winnable at home to Mickleover Sports on Saturday (April 23), but they will need plenty of favours from elsewhere to pull off a ‘Great Escape’ for a second successive season. There’s also a United Counties Premier Division ‘derby’ tonight as Wisbech Town host Holbeach United at Fenland Park. Holbeach have lost their last three games thanks in part to a gruelling schedule as they try and catch up with their fixtures. The Tigers are also at Rothwell Corinthians on Thursday (April 21). Division One leaders Peterborough Sports play their re-arranged game at Bugbrooke St Michaels tomorrow (April 20). The match was postponed on Saturday (April 16) because of a water-logged pitch. Moulton Harrox will lift the Peterborough Premier Division title tonight if they maintain their unbeaten record at local rivals Pinchbeck tonight. A point will be enough for the long-time leaders. Netherton could move up to third if they win at Leverington and Pinchbeck fail to win. There’s a Hunts Sunday Cup Final between Peterborough Sunday Morning League sides Cardea and Farcet United at Yaxley FC tomorrow (7.30pm kick off). Cardea play a division higher than Farcet and will start as hot favourites. Northern Premier Division: Skelmersdale Utd v Stamford. Premier Division: Wisbech Town v Holbeach Utd. Premier Division: AFC Stanground v Stilton United, Leverington Sports v Netherton United, Pinchbeck United v Moulton Harrox, Sawtry v Peterborough Sports Res. Division Two: Whittlesey Athletic ‘A’ v Ketton Res. Division Four: Tydd St Mary Res v Holbeach Bank. Premier Division: Huntingdon v Eynesbury. Division One: Bugbrooke St Michaels v Peterborough Sports. Division One: Stamford Lions v Stamford Belvedere. Division Four: FC Peterborough v Parkside. Cardea FC v Farcet Utd. Premier Division: Rothwell Corinthians v Holbeach United.